Always a much-sought-after object, and an exciting conversation piece! A wonderful Globe of the Earth made from Light Ivory - Scrimshawed in color with all the continents, some lines of longitude, colored 'track' equator, as well as major rivers and mountain ranges. All are shown all around this wonderful globe. (You'll feel like an astronaut looking at the world from outer space!) Choose from other diameters as options. 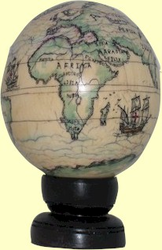 We can scrimshaw any old map or type of projection for your globe, and have done a number of old world globes. We can discuss your needs and then set up our Special Order Page with all your requirements. Please note that all of our globes are made from spheres that are at least 150 years old. They have been used as billiard balls, etc. For this reason, please allow plus or minus 1/16 inch in diameter for all spheres. Each globe will have some crazing at the north and south poles that extends about 45 degrees from each pole. The actual colors used on each globe will vary depending on the original hue of the billiard ball. 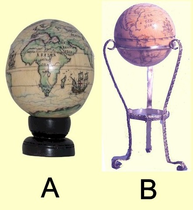 As an option, let us design and handcraft a wooden stand (shown as "A" in insert holding a Portuguese map dated 1630), or a Sterling Silver stand with three gemstones (shown as "B" in insert holding an old Spanish map) or wood/Ivory inlay stand (not shown) in our studio for your Earth Globe. Just email us to start discussions!